A play returns to its roots. Floyd ‘Schoolboy’ Barton (Jonathan Berry) and Vera (Ty Barrow) trying to keep their relationship on the right track. There is something truly exceptional about seeing a play while immersed in the storyline’s actual setting. This is the case with Pittsburgh playwright August Wilson’s (1945-2005) Seven Guitars. 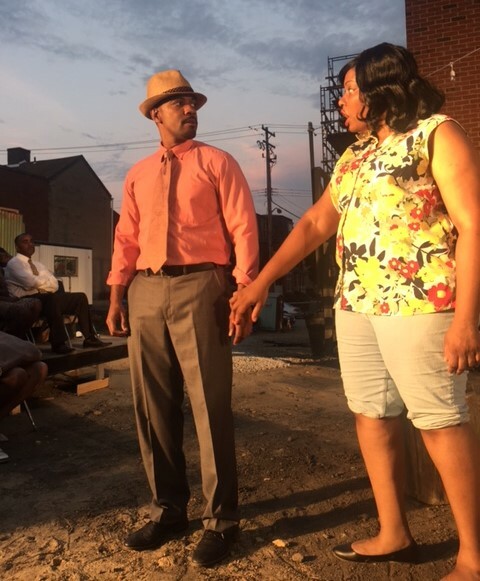 The play is being produced by Pittsburgh Playwrights Theatre Company in the backyard of Wilson’s childhood home in the Hill District. The house—at 1727 Bedford Ave.—was placed on the National Register of Historic Places in 2013 and is currently being fully restored. It will be part of the new Daisy Wilson Artist Community. Wilson was the son of an African American cleaning woman, Daisy Wilson, and a German/Czech baker, Frederick August Kittel, Sr. Wilson was originally named Frederick August Kittel, Jr. but renamed himself August Wilson after his parents broke up and his father was no longer around much. Wilson’s mom later remarried and the family moved to the predominately white Hazelwood neighborhood of Pittsburgh. Wilson attended several different high schools but never graduated. He went almost every day to the Carnegie Library in Oakland, so much so that he received the only honorary high school diploma the library ever granted. Wilson was a student of life and everyday people’s dialogues. He would go to coffee shops and restaurants, listening to the conversations around him and jotting notes about their manner of speaking and what they talked about. This would serve him well as he went on to write 16 plays. Most noted is his canon of 10 Century Cycle plays, including the Pulitzer Prize-winning Fences and The Piano Lesson. Nine plays in the cycle are set in Pittsburgh’s Hill District. The plays chronicle black life in every decade of the twentieth century, from the 1900s through the 1990s. 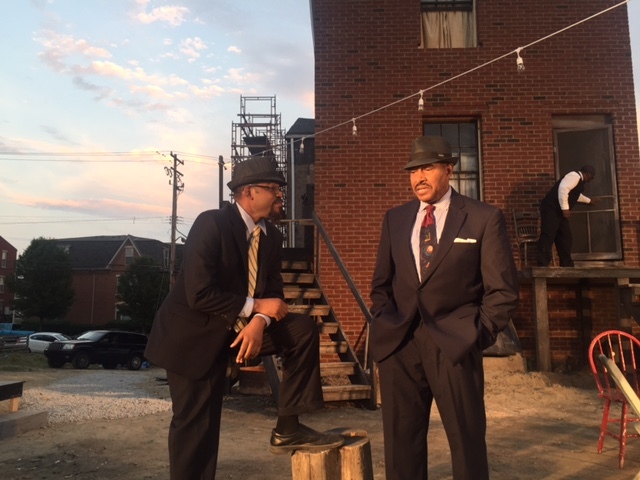 Several cast members performing on the backyard set of ‘Seven Guitars’ at August Wilson’s childhood home in the Hill District with a bank of theatrical lights shining on them. Seven Guitars refers to the seven main characters in the play. Wilson described Seven Guitars as “theatrical blues.” The play, which premiered in 1996 and was nominated for a Pulitzer Prize and Tony, is set in 1948. The play is a tragicomedy that opens and closes at the funeral of Floyd “Schoolboy” Barton, with the story unfolding in a series of flashbacks. Seven Guitars revolves around singer-guitarist Barton and his twin ambitions of making it big in the recording industry and winning back his girlfriend Vera. After the funeral scene, we see Barton singing and dancing to his hit song on the radio, “That’s All Right,” outside the apartment house (Wilson’s childhood home) where he and Vera once lived; Vera still lives there. He’s just been released from the county workhouse where he spent time on a bogus charge and has an offer letter in his pocket asking him to return to Chicago and record some new songs. Although he’s had a major hit, it hasn’t put much money in his wallet because of the deal he agreed to. He has another problem as well; the last time he went to Chicago it was with another woman. Barton calls out to Vera to come outside, and she eventually does. She is not overjoyed to see him and mentions his trip to Chicago with another women. He did go, he says, but that was because the other woman saw possibilities and believed it was conceivable for him to have a hit record. Vera did not see this as attainable. He tells her about his new record contract, and that he wants her to come with him. She’s skeptical, concerned that he’ll dump her again. Barton mentions the letter he sent her while at the workhouse. She says she got it and that it had some nice lines. He tells her that he paid someone there to write it. Barton also tells her how captivating she looked the first time he saw her. Vera warms to his charms, and they head into her apartment. He still hasn’t convinced her to come to Chicago with him, though, which is a main storyline in the play. Barton displays a range of emotions running from hopeful and optimistic to reflective and quick-tempered. Jonathan Berry plays Barton with great animation using crisp, rapid-fire dialogue. Ty Barrow excels as Vera, speaking in a melodic yet slightly halting manner, and she is masterful at flashing occasional looks of disgust at Barton. Barton’s musical combo includes his friends Canewell and Red Carter. Canewell says his father’s surname came from his remarkable ability to cut sugar cane. he jokes that he’s glad his dad didn’t pick cotton, or else he’d be called Cottonwell. Playing harmonica in Barton’s band, Canewell comes off as an agreeable man, but says he wouldn’t hesitate to cut someone with a switch blade if they deserved it. He’s always impeccably dressed with a fedora, nice suits, shirts and shoes, and if he ever sits on steps or a stump, he puts his handkerchief down first. Also quick with a smooth line or colorful tale, Canewell is played by Kevin Brown in an expressive manner and with a jaunty gait and an ever-present toothpick extruding from his mouth. Red Carter (Leslie “Ezra” Smith) l., and Canewell (Kevin Brown) r., in their funeral best. Drummer Red Carter says that when he’s working, he has a girl for every day of the week. But when he tried switching girls around to different days, things went awry. They all wanted to be his Friday girl (maybe Friday was payday), and the situation got so stressful, he quit his job. Leslie “Ezra” Smith” portrays Carter and keeps the character on a steady beat, especially when tapping his drumsticks. Barton is also trying to convince Canewell and Carter to return to Chicago with him to cut the new record. Canewell is hesitant because he was arrested for busking the last time he was there. Even though the seven are friends, they are not immune from heated discussions and confrontations. Rivaling Barton for the wildest character is Hedley, a neighborhood huckster who sells eggs, sandwiches, and cigarettes (although not the Old Gold brand, to the dismay of Vera’s neighbor, Louise). Hedley is a loose cannon whose favorite subjects are talking about how the white man is keeping him down, that his dead father came to him in a dream to tell him he was going to send money through musician Buddy Bolden so he can buy a plantation, and that “Ethiopia will rise up.” His outfit is mostly jeans, white T-shirt, and a denim apron with a metal coin changer clipped to it. He also lives in the apartment building. Hedley is played by Wali Jamal, who does so with skill and vigor, speaking in the character’s Caribbean Island accent. Another interesting character is Louise, who imparts wisdom and offers comic relief to her neighbors. She also loves to flirt with the fellas. About halfway through the play, Louise’s niece Ruby, a southern belle from Alabama, comes for an extended visit. Ruby is like a cute and stylish hurricane, creating havoc in whatever direction she turns. Both Teri Bridgett (Louise) and Jamilah Chanie (Ruby) made their mark on the production, as does Lonzo Green (milkman) and Sam Lothard (ice man). Several of the cast had previously acted in Wilson plays. There’s a lot of talk over many different subjects throughout the play: the best way to cook greens, whether a person with a handgun (both Barton and Carter have a gun) can beat a person with a knife, religion, Joe Lewis, and police harassment. Barton says that the police can arrest you for having no money in your pockets (vagrancy) or for having too much money in your pockets (suspicion of committing a crime), and then the police put the money in their own pockets. With these extended casual conversations, Wilson gives the audience a slice of the culture and concerns of black lives in the late 1940s while also filling out the characters. Barton wins over Vera, who agrees to go with him to Chicago. Canewell and Carter are going too. Just when it looks like everything will be alright for Barton, obstacles arise. He loses his pay sheet from the workhouse and can’t get his prized guitar out of the pawn shop. When he finally has the money, the pawn shop owner is nowhere to be found. He laments to the heavens that he’s had seven ways to go but is now down to only two. In a powerful scene he loudly exclaims, “I don’t want to live in a cold house. It’s a cold world. Let me have some shelter.” He’s starting to feel a little desperate and willing to take a chance to guarantee his success. The plot is now fully primed for a furious finish. Seven Guitars, and especially the Pittsburgh Playwrights Theater Company’s production of it, works on a multitude of levels. 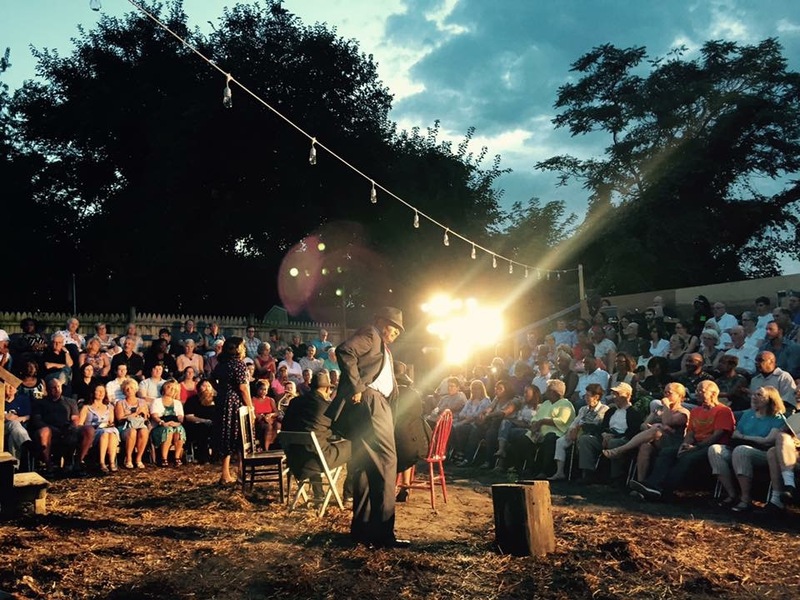 There’s the high-quality script with great characters, talented actors performing at Wilson’s childhood home, and a setting with the feel of a neighborhood gathering. The free-range chickens in the backyard add a nice touch, too. At intermission I was standing in the line for refreshments and talking to a man about the play and he said, referring to the whole experience “It’s beautiful” and then repeated those words. That sums it up pretty well. Seven Guitars is directed by Pittsburgh Playwrights’ founder and Producing Artistic Director Mark Clayton Southers. Southers took a playwriting masters class from Wilson in South Africa and later that same year did seated stage readings of all of Wilson’s plays—with Wilson—at the Edward Albee Theatre Festival in Valdez, Alaska. These encounters with Wilson encouraged Southers to take up playwriting and resulted in a life-long affinity for Wilson’s work. Southers’ knowledge of his mentor’s body of work is evident in the smooth, well-staged presentation of Seven Guitars. Seven Guitars continues through Sunday, Aug. 28, with matinée performances just added on for Aug. 27 and 28. For tickets or more information, visit the website. Parking and shuttle service is included with the ticket. Photos courtesy of Pittsburgh Playwrights Theatre Company. Rick Handler is executive producer of Entertainment Central Pittsburgh and enjoys seeing great theater.